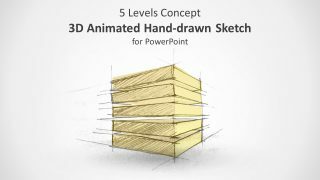 The 3D Animated Origami Concept PowerPoint Template is an outstanding presentation of unique paper folds. It is an illustration of fortune-telling game for children. 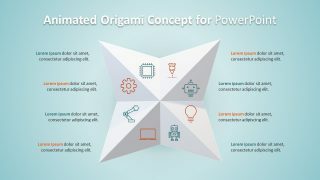 PowerPoint template of origami concept is a metaphor presentation of this game. However, it also helps discuss the human mind and folds of science. 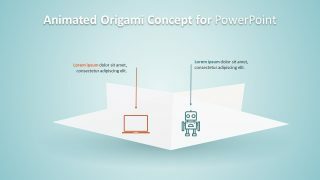 Further, the 3D animated PowerPoint templates of origami are the metaphor for clean language. The clean language is a business term for understanding client’s extensive requirement. The metaphor visually depicts the additional information which client reveals at each fold. The exceptional design of PowerPoint 3D shapes to demonstrate the idea of perfection embedded in Japanese culture. That is, how one wrong crease can cause the entire system/project to fall apart. 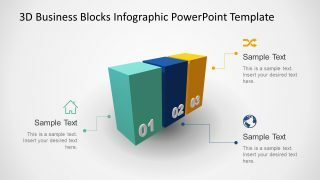 This template is an exclusive 6-slide of 3D shapes in PowerPoint. It shows all four corners of the 4-star origami in an amazing animation. 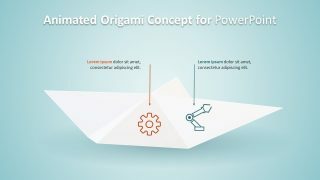 The 3D Animated Origami Concept PowerPoint Template provides the top-view of an 8-step diagram. The diagram contains set of cool clip art icons which represent each step. 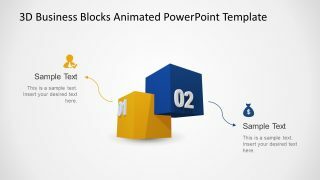 Whereas, the animation demonstrates the creative transition of both objects and 3D PowerPoint slides. The 3D layout and animations make the presentation appealing to the audience. It adds the wow-factor to the overall presentation, irrespective of the concept it displays. 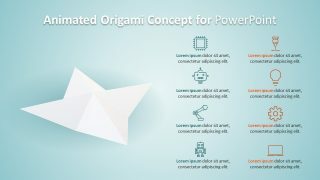 The 3D PowerPoint presentation of animated origami concept contains editable shapes and icons. 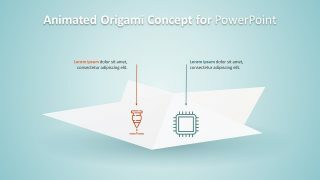 The users can customize the origami paper folds by changing the colors or icons. 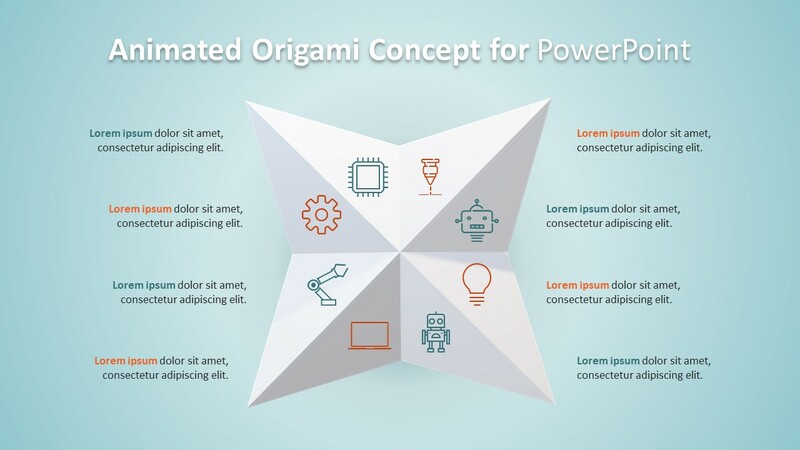 The fortune-telling origami in this PowerPoint is ideal for project presenters. They can explain the growth in folding, leading to the new dimensions. 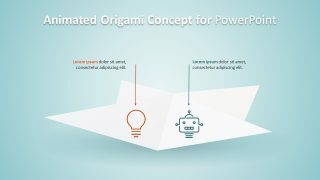 The 3D animated template of Origami-inspired PowerPoint holds the best feature for last. The last slide of origami concept has a 360-degree rotation animation of 3D shape. 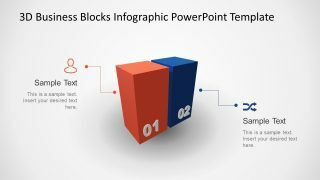 Moreover, the clip arts representing 8 steps of the PowerPoint diagram appear on the right side.